This is one of the new stamps from Your Next Stamp named Holiday Joy Robin~ so sweet! I colored this cutie the same colors as the inspiration picture and used a combo of Jillibean Soup Apple Cheddar Soup and Winter Tortellini and Spinach Soup. I stamped the image twice, cut one out with Oval Nestabilities and embossed it with the CB Snowflake embossing folder. I cut the bird out of the second stamped image and popped it up with a foam square. The sentiment is one of 2 that comes with the set, and the layout is The Sweet Stop Sketch #183. We hope you'll play along with us this week! Just link your projects on the Color Throwdown Blog HERE, and make sure you check out the rest of the awesome DT creations while you're there! Thank you so much for stopping by. We have a sick household once again. My poor daughter just gets sick so often this time of year with asthma/pneumonia type symptoms and Carson and I have a bit of a cold. I'm thinking a trip to the doctor may be on our to do list today if my daughter still has a fever this morning:( Hope your day is better! What a beautiful card Kerri. I hope your family feels better soon! We've been passing around the throw up virus--ugh! Oh my gosh! 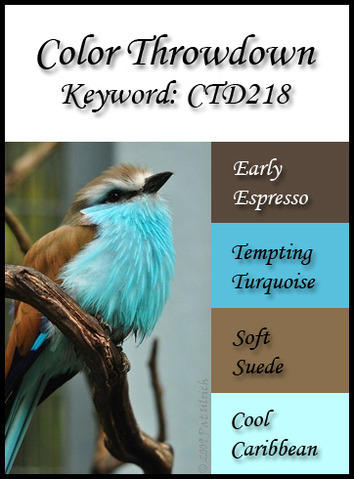 How perfect is that adorable little bird to use for this week's inspiration! I love these colors too and your card is just wonderful! That little bird is just too stinkin' cute! He looks great in these colors! So sorry you have sickness in the house...no fun! Praying all will get well soon! Just had to pop back over to your blog as I totally forgot to comment on the race! I agree with you...a bit out of character, but I'm not sad as I think the 15 had it "owed" to him - lol! Hope all your family gets better soon! Your card is so cute, Kerri! Too sweet! 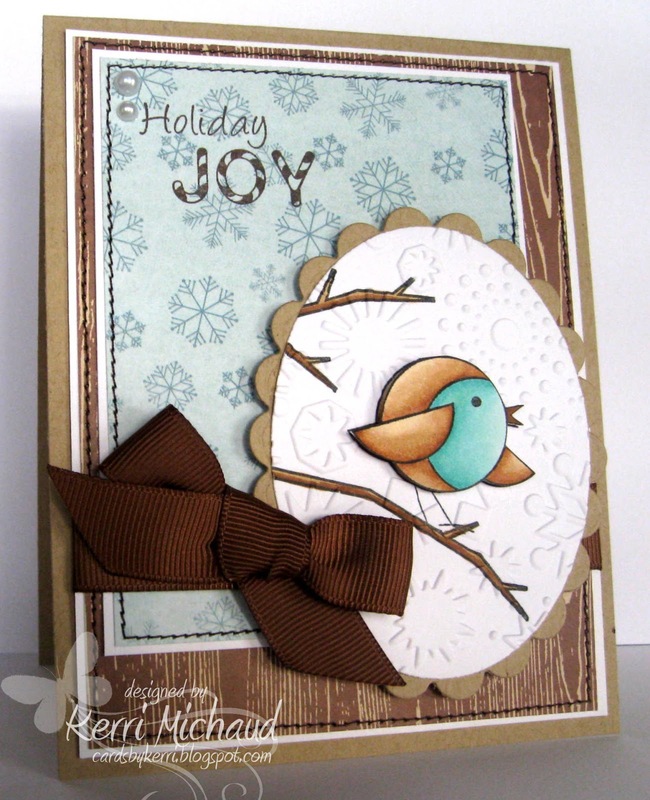 Love the bird on the snowflake embossed panel--it really stands out. Hope everyone in your house is feeling better soon! The little bird is sooo sweet and looks adorable on your Christmas card....love this, Kerri!!!! What a lovely card , you made !! We have the same banner on our blog haha , very cute . Love this card Kerri. Fabulous color combo!! Darling card, Kerri! That little bird is adorable!